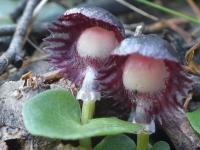 Acianthus collinus Inland Pixie-caps Photo E Collins Uncommon. 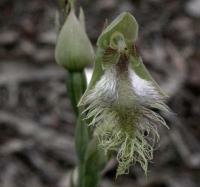 Calochilus robertsonii Beard Orchid Photo E Collins A delicate, rare, green form. 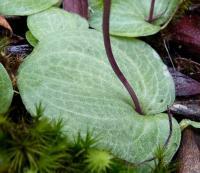 Photo E Collins A delicate, rare, green form. 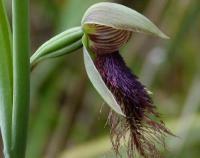 Calochilus robertsonii Purple Beard-orchid Photo E Collins Flowers September-January. Occasionally the beard is silvery green. Photo E Collins Flowers September-January. Occasionally the beard is silvery green. 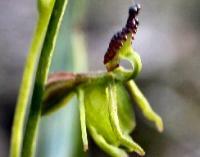 Chiloglottis trapeziformis Dainty Wasp-orchid Photo N Blair Distinguish by its trapeziform shaped labellum with prominent dark calli resembling a bunch of grapes. 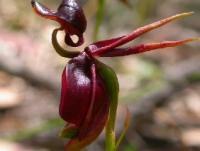 Aug-Sept.
Photo N Blair Distinguish by its trapeziform shaped labellum with prominent dark calli resembling a bunch of grapes. 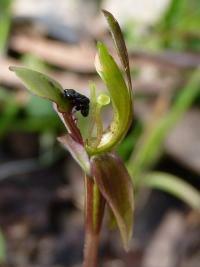 Aug-Sept.
Cyrtostylis reniformis leaf Small Gnat-orchid Photo Neil Blair Nice leaf detail. The underside is green. Photo Neil Blair Nice leaf detail. 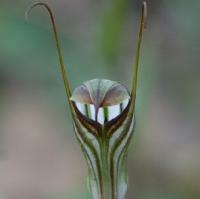 The underside is green. 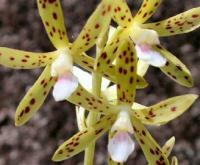 Dipodium hamiltonianum Yellow Hyacinth-orchid Photo E Collins This spectacular orchid is a leafless parasite and an endangered species. 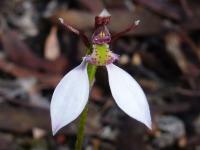 Photo E Collins This spectacular orchid is a leafless parasite and an endangered species. 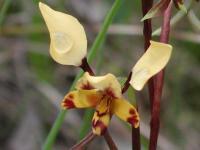 Diuris punctata Purple Diuris Photo E Collins A spectacular species of wetter habitats. 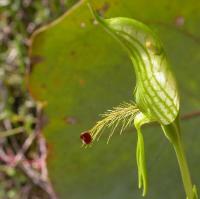 Photo E Collins A spectacular species of wetter habitats. 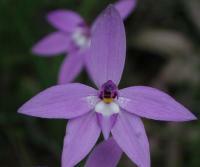 Glossodia major Waxlip Orchid Photo E Collins The white waxy part of the labellum gives this lovely orchid its common name. 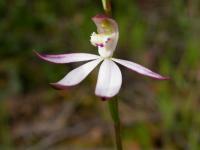 Photo E Collins The white waxy part of the labellum gives this lovely orchid its common name. 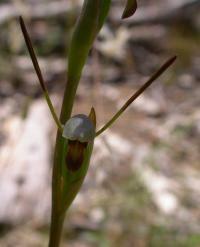 Orthoceras strictum Horned Orchid Photo E Collins Flowers Nov-Dec and confined to Pilot section of the park. 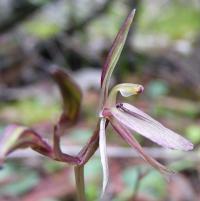 Photo E Collins Flowers Nov-Dec and confined to Pilot section of the park. 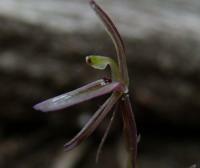 Paracaleana minor Small Duck-orchid Photo E Collins Rare in the park. 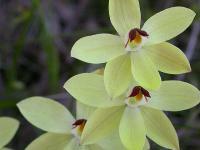 Flowers from October to December. Photo E Collins Rare in the park. 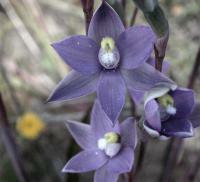 Flowers from October to December. 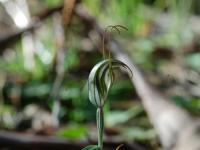 Pterostylis curta Blunt Greenhood Photo E Collins The dark, twisted labellum helps to identify this greenhood. Often found under Cherry Ballart. 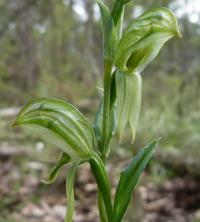 Photo E Collins The dark, twisted labellum helps to identify this greenhood. Often found under Cherry Ballart. 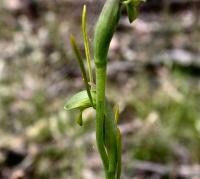 Pterostylis cycnocephala Swan Greenhood Photo E Collins Uncommon. Flowers August to October. Photo E Collins Uncommon. Flowers August to October. 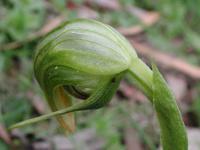 Pterostylis nutans Nodding Greenhood Photo E Collins May-Dec. Can form large colonies often under the shade of Cherry Ballart in Chiltern. 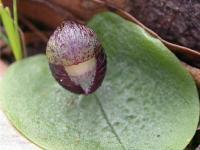 Photo E Collins May-Dec. Can form large colonies often under the shade of Cherry Ballart in Chiltern. 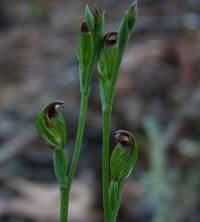 Pterostylis pedunculata Maroonhood August Photo E Collins An easily overlooked species. 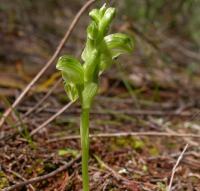 Occasionally occurs in green form. 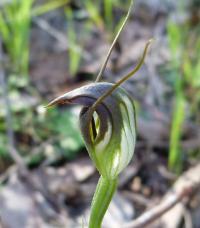 Pterostylis plumosa Woodland Bearded Greenhood Photo E Collins Sept-Nov An elegant and unusual orchid. Uncommon. 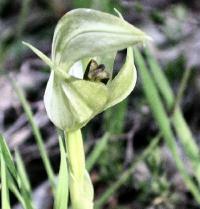 Photo E Collins Sept-Nov An elegant and unusual orchid. Uncommon. 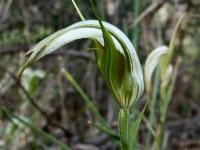 Pterostylis striata Striated Greenhood Photo E Collins Flowering time June-July. Uncommon in Chiltern. 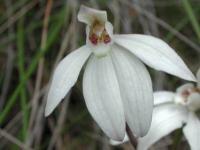 Photo E Collins Flowering time June-July. Uncommon in Chiltern. 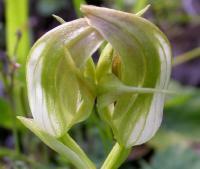 Pterostylis striata Striated Greenhood Photo E Collins Flowers June-July.Flowering plant lacks the basal rosette.Uncommon in Chiltern. 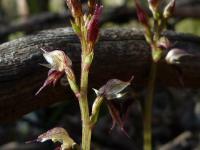 Photo E Collins Flowers June-July.Flowering plant lacks the basal rosette.Uncommon in Chiltern. 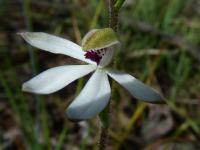 Thelymitra antennifera Rabbit Ears Photo E Collins A delicate yellow Sun-orchid. 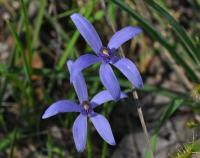 Flowers in Chiltern in October. 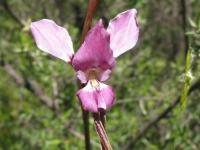 The column has distinctive brown lobes which give it the common name of Rabbit Ears. 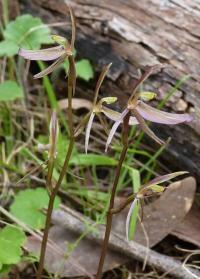 Photo E Collins A delicate yellow Sun-orchid. Flowers in Chiltern in October. 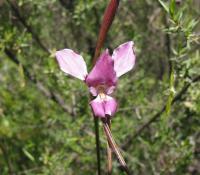 The column has distinctive brown lobes which give it the common name of Rabbit Ears.